Olivia Vanni / The Herald A ferry pulls into the current Mukilteo Ferry Terminal as construction continues on at the site of the new Mukilteo ferry terminal on Wednesday. Unless you were right there, you wouldn’t know there was a big hoopla happening Wednesday morning in the cordoned-off construction zone of the new ferry terminal. Amid anticipation, and with a dozen cameras trained, a crane slowly lifted the brace covering part of a spartan concrete wall at the water’s edge. It revealed … more gray concrete. It was a grand reveal, Washington State Ferries-style. Not HGTV-style. The pretty stuff will come later. 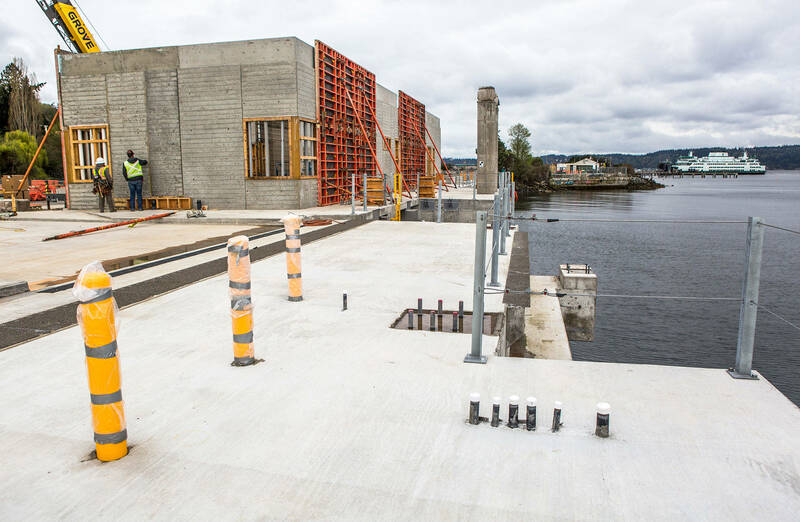 “This is a significant starting milestone for the future ferry terminal,” said Nicole McIntosh, director of terminal engineering for Washington State Ferries. The walls are part of the first level of the complex with holding lanes and an overhead bridge, which the existing terminal lacks. McIntosh and others in hardhats stood on the foundation of what will be the elevator shaft, against the backdrop of ferries crisscrossing Puget Sound on the 20-minute Mukilteo-Clinton route from the old terminal one-third of a mile away. There was no champagne or any appetizers at Wednesday’s event, though a construction worker on site offered to share his lunch. About 60 workers are often on hand in this stage of the job. Construction on the passenger building, lanes, toll plaza and promenade was started earlier this year by IMCO General Construction, the lowest bidder, which landed the deal for $49.7 million. It hasn’t always been smooth sailing. Terminal construction was delayed when the five bids for this major phase were rejected in August. State Department of Transportation engineers came up with an estimate of $65 million for work that includes upland buildings and the marine structures. The lowest contractor bid came in at $8 million over the estimate but was rejected for irregularities. The next was $18 million over budget. Bids went up from there. After seeking feedback from bidders, some aspects were re-examined and tweaked to keep it within budget. That led to a decision to split it into two contracts, one for upland and another for marine elements. The marine phase will soon be up for bid, subject to the Legislature’s approval. This includes a fishing pier along the waterfront to replace the popular one now on the Ivar’s side of the terminal. The existing terminal was built in 1957 to accommodate the much-lesser traffic of 62 years ago. “It is the busiest vehicle route in our system, with 2.3 million vehicles per year,” McIntosh said. With 4.2 million riders annually, the route is not the busiest overall in terms of passengers. That would be the Seattle-Bainbridge Island run. Construction has resulted in an increase of heavy vehicles to the Mukilteo waterfront, resulting in minor traffic delays. Diane Rhodes, ferry spokeswoman, said over the next few weeks there will be big trucks on the Mukilteo Speedway hauling in fill for the exit lanes. “The trucks will be spaced out. There will be about six to eight per hour,” Rhodes said. Rhodes said trucking hours are 7 a.m. to 2:45 p.m. Monday through Thursday, and 7 a.m. to 1 p.m. Friday. Flaggers will be in place during those times.